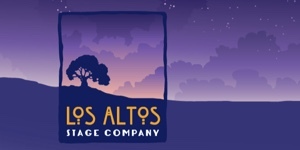 The City of Los Altos asked the consultant how doubling the allowable density on El Camino would look. 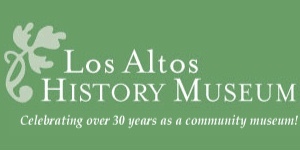 On Jan. 16, 2018 the Los Altos City Council and Planning Commission studied two things. 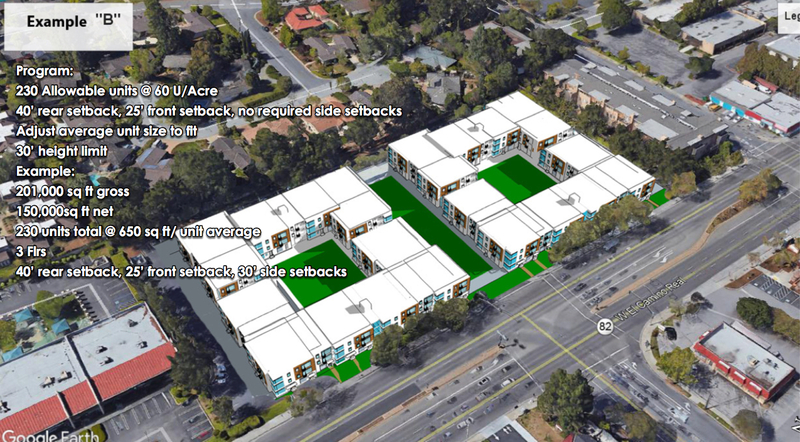 1) Conceptual designs for higher density housing zoning along El Camino – namely raising density from the current 38 du/ac to 60 or 80 du/ac. 2) What the California housing laws 2017 mean for the City. 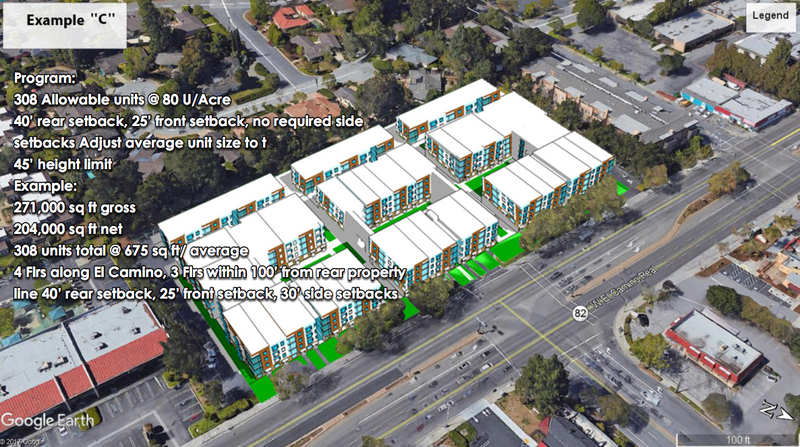 The Council was trying to see if increasing the max 38 du/ac in the El Camino CT zone would result in more units that would be “affordable by design” because they are smaller. They wanted to know what such El Camino housing might look like and what impact it might have on rear neighbors. 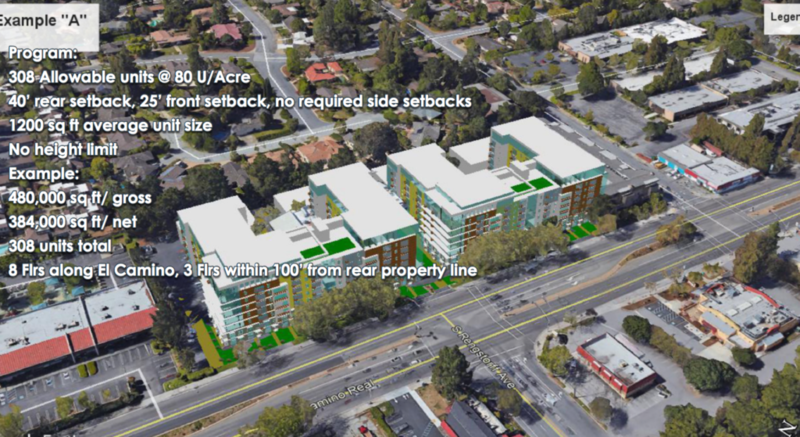 Unlike the City of Mountain View, Los Altos has almost no “buffer zone” — a zone with medium density multi-family behind El Camino. 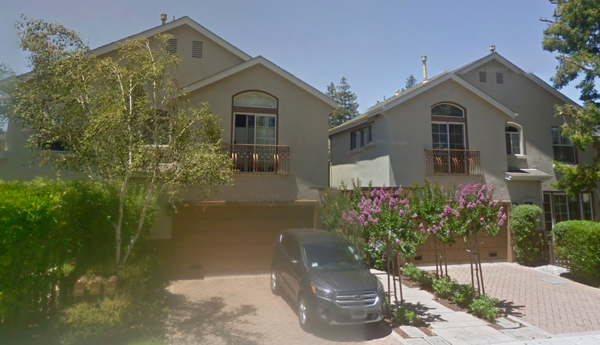 In Los Altos the area behind El Camino parcels often transitions immediately to single family homes. The Higher Density Housing report and graphics from the Staff and the consultant is here . The City lawyers have prepared an excellent 15 State Housing Laws report here. The meeting video is here. The lawyer takes almost 90 minutes to walk through the state laws. Reading Lalah’s excerpts from the the League of Cities and from the City lawyer’s report will take you 5 minutes. But if you have the time, the lawyer’s talk and the Q&A are quite informative. The consultant created 3 concepts and placed them on a real parcel which is for sale. 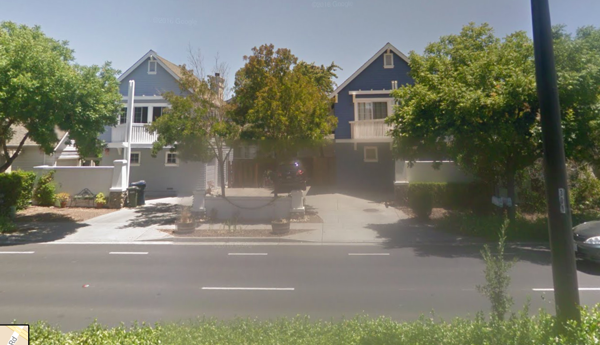 That parcel is 5150 El Camino, right at the intersection with Rengstorff. Right now on this parcel, there is a medium-sized 3-story office complex with large side and rear setbacks. The ground floor is sunken so the building height above street level appears to be no more that 30 feet. 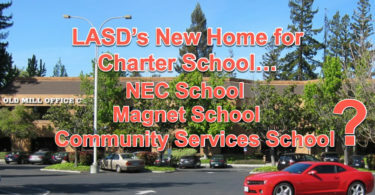 This almost 4 acre parcel had been considered by LASD as a site for the Bullis Charter School last year. A: 308 units, 80 du/ac, 1200 sq.ft. 230 units, 60 du/ac, 650 sq.ft. 308 units, 80 du/ac, 675 sq.ft. To be clear, let me reiterate this is not a project concept proposal from an actual developer. It is a consultant study requested by City Council. This is not a real project, just pretend. Concept A is ~90 feet high along El Camino and probably ~35 feet high along the rear line. B is 30 feet high everywhere, El Camino and rear line. C is 45 feet high on El Camino and probably ~30 high along the rear line. All concepts meet the 40 feet from rear property line zoning requirement…for floors up to 30 ft high. There is not enough information to make a choice. The developer economics are missing. Will 650 sq. ft units be rentable? or saleable if a condo? Would someone pay $2400 a month for a nice and new 650 unit or rather seek out a worn out but larger 1200 square foot unit at $2400 a month? Do we know? So these small units are “affordable by design” but is the developer also going to use the the density bonus law and create some BMR units? Is this within 1/2 mile of a public transit hub? The express bus stop is by Whole Foods at Showers or Panera at El Monte? So there is no need for underground parking? These “what if” concepts don’t explore parking at all. 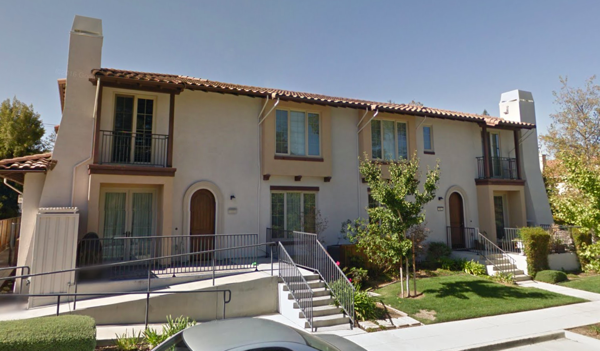 This 5150 El Camino parcel is in the City’s RHNA inventory. Because of the new Housing Laws 2017, the State can punish the City if it is unable to keep the promises it has made in the Housing Element Plan for the 2014-2023 RHNA plan cycle. Therefore, For this parcel in particular, it is certainly is tempting to try to maximize the number of BMRs –XLI, VLI, LI, Moderate income — dwelling units here…subject to the constraint that the economics of the number of market rate units allow a whole project to actually get built. The City Housing Element report estimates 144 units could be built here at 38 du/ac. These consultant “what if” plans at 60 and 80 du/ac show 230 and 308 units. This parcel could be part of a WHOZ, Workforce Housing Opportunity Zone..if the City can jump through all the the hoops to create one — a Precise Plan/Specific Plan, an EIR. However, because the developer is required to “pay prevailing wage” per the WHOZ law, there might be zero developer interest. 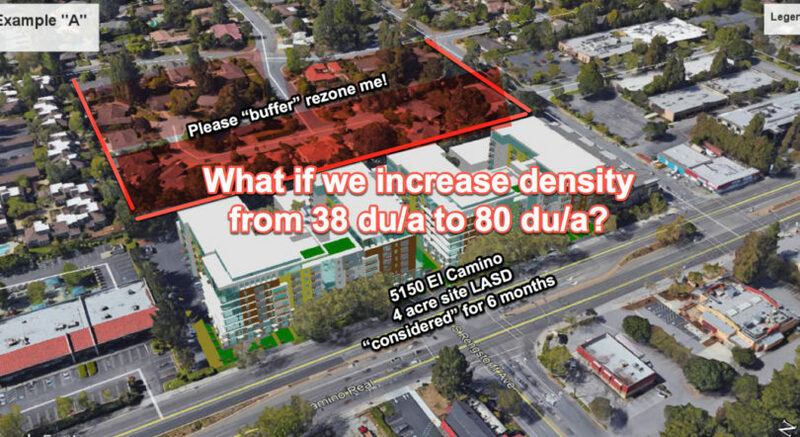 After the presentation, Council members and planning commissioners seemed to realize that if the only policy change was raising du/ac from 38 to much higher on El Camino, that ALONE was not going to be the panacea they had hoped it might be. And it seemed to clear to Lalahpolitico, the developer economics on El Camino means the City should be thinking about how to create a neighboring buffer zone. The City needs to consider how to create buffer zones for this fictitious example housing development…and for any other actual mega housing developments that may be proposed in the El Camino commercial thoroughfare zone in the next decade. In the case of 5150 El Camino, how about giving all those Casita homes with their R1-10 zoning… which allows 35% lot coverage… a big rezoning boost up to duplex with 70% lot coverage? That’s like going from 4 du/ac to 8 du/ac. That’s serious money in their pocket when they sell. Yeah, it will change the neighborhood…but so will concepts 5150 El Camino concepts A,B,C. Duplexes would get built lot by lot, a spot here and a spot there. An approach that would encourage the single family home parcels to be aggregated… perhaps to a minimum 1, 2 or 3 contiguous acres…would allow a more planned community, a more aesthetic look and feel. Graduated Density Zoning is such an approach. Until an owner acquires a minimum threshold of continguous acres, all that can be built is single family R1-10 homes. Once an owner has say 2 acres, he can build a project at say 16 du/acre. Such aggregation of 1/4 acre parcels would make higher densities feasible…say 16 du/ac. With 2 or 3 acres, alleys could be added to a project, there could be shared common yards. 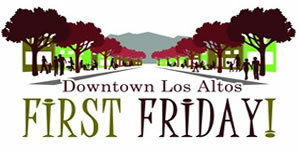 Think of Tyndell and Lassen near Cuesta downtown, or San Antonio near Chester Circle. GDZ works like the Monopoly board game. You have to aggregate 4 HOUSES on your land, before you can exchange them for a HOTEL. 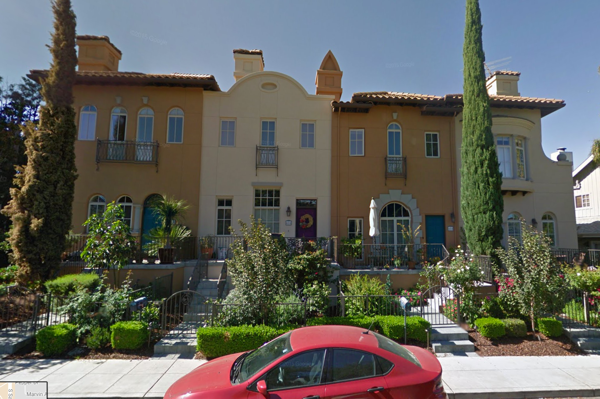 First a google map pic from Chester Circle along San Antonio, then 3 pics from the Cuesta neighborhood near Downtown . Lalahpolitico: Looks pretty ok to me. I would not mind if this king of housing were across the street from my single family home…which abutted a “buffer” zone for El Camino high density. So let’s look at “paying off “the home owners who are most impacted by El Camino becoming high-rise…help them cope with El Camino height and bulk and loss of privacy.. by rezoning them for a big pay-day. Rezoning them does not force them to suddenly sell and move; it’s just an medium-term option. It might take a decade or more for a buffer zone to emerge through market forces. If the City study session had chosen to move forward with new zoning, increasing the du/ac on El Camino from 38 du/ac to 60 or 80 du/ac would require an amendment to the General Plan Land Use chapter. If the City choses to move forward with higher inclusionary zoning requirements than in State law [15%] that may trigger a need to modify the Housing Element plan chapter. If the City choses to move forward with a BMR housing in lieu fee, or a housing impact fee, the documents will have to be modified. That means these documents will need to be recertified by the State Housing and Community Development Department…quite an undertaking…and quite a delay until the desired law changes can take effect. Here follows a summary of the California housing laws 2017 penned by the California League of Cities. It’s from their Jan. 23 Letter to California State Senator Scott Wiener, opposing a new bill SB827. According to the League, SB827 allows a developer to evade local standards merely if a project is along “a high-quality transit corridor.” Lalahpolitico: Not much of a hurdle! These California housing laws 2017 below took effect Jan. 1, 2018. $225 recording fee on specified real estate documents.  SB 3 (Beall, Chapter 365, Statutes of 2017) Veterans and Affordable Housing Bond Act of 2018 places a $4 billion general obligation bond on the November 2018 ballot to fund affordable housing programs and the veterans homeownership program (CalVet).  SB 35 (Wiener, Chapter 366, Statutes of 2017) streamlines multifamily housing project approvals, at the request of a developer, in a city that fails to issue building permits for its share of the regional housing need by income category.  SB 166 (Skinner, Chapter 367, Statutes of 2017) requires cities and counties to provide enough housing sites to meet RHNA at each income level at all times.  SB 167 (Skinner, Chapter 368, Statutes of 2017), AB 678 (Bocanegra, Chapter 373, Statutes of 2017), and AB 1515 (Daly, Chapter 378, Statutes of 2017) makes numerous changes to the Housing Accountability Act, including imposing mandatory fines for defying a court order, and modifying the findings requirement to deny a housing development project to be supported by a preponderance of the evidence, rather than by substantial evidence in the record.  SB 540 (Roth, Chapter 369, Statutes of 2017) streamlines the housing approval process by conducting all of the necessary planning, environmental review and public input on the front end through the adoption of a detailed Specific Plan. Workforce Housing Opportunity Zone.  AB 72 (Santiago, Chapter 370, Statutes of 2017) provides the Department of Housing and Community Development (HCD) new broad authority to find a jurisdiction’s housing element out of substantial compliance if it determines that the jurisdiction fails to act in compliance with its housing element and allows HCD to refer violations of law to the attorney general.  AB 73 (Chiu, Chapter 371, Statutes of 2017) streamlines the housing approval process by allowing jurisdictions to create a housing sustainability district to complete upfront zoning and environmental review in order to receive incentive payments for development projects that are consistent with the ordinance. 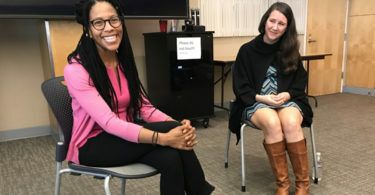  AB 879 (Grayson, Chapter 374, Statutes of 2017) expands upon existing law that requires, by April 1 of each year, cities to send an annual report to their respective city councils, the state Office of Planning and Research and HCD that includes information related to the implementation of the General Plan.  AB 1505 (Bloom, Chapter 376, Statutes of 2017) allows a jurisdiction to adopt an ordinance that requires a housing development to include a certain percentage of residential rental units affordable to and occupied by households with incomes that do not exceed limits for households with extremely low, very low, low or moderate income. Lalahpolitico: All the new laws mean the City needs some additional permanent and temporary staff and more consultants of course in order to comply! 1.Find out if we will meet our Housing Production Goals for 2023? It would be advisable to take stock of where the City is at with meeting its RHNA goals (by income category) for this planning period. All new applications for sites in the housing element inventory will require careful review and analysis with regard to these new provisions [and whether they further meeting the goals]. 2.Plan how to capture the new, extra data types. One new burden is the expansion of housing data collection to include the status of various housing activities by the 5 BMR income levels . This seems to at least double the complexity. Keeping track of the inventory of buildable lots suitable for housing has also become more complicated. The City may wish to consider implementing steps to begin capturing all of this information so that records can be developed…number of applications submitted, approved, not approved, completions, sites rezoned … BY BMR INCOME CATEGORY. 3.Rewrite subjective zoning criteria to be objective. The new housing laws “streamline” a developers process – removing both governmental and other impediments that slow down a project. The City will need to review/redo its process and forms, etc. to foster proper and rapid compliance. 5.Be careful not to make Inclusionary Zoning too high, aka >15% BMRs. The City may wish to consider whether it would like to explore the development of a WHOZ [Workforce Housing Opportunity Zone], the planning of which may be eligible for SB 2 funding in 2018…. While these [Precise Plan with a pre-done EIR] are not required to be put in place locally, adoption of a thoughtfully-crafted WHOZ might capture the attention of developers who may otherwise consider using SB 35 to secure expedited processing. Lalahpolitico: A WHOZ – once set up – could deliver a very quick development application processing/construction.